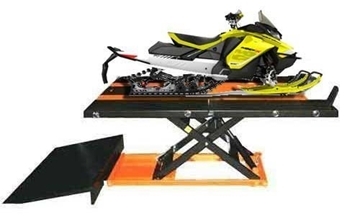 The Elevator 1100S heavy duty air lift table includes a 4 piece (quarters) equal sized panel side extension kit with ramps expands width of table to 48", enabling the lift to handle all types of snowmobiles, power sleds, and even snowblowers. Elevator 1800S heavy duty table features a 4 piece (quarters) side extension kit with ramps, expanding the lift width to 56". 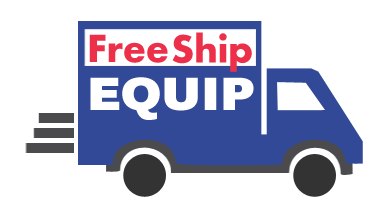 Optional kit to 69" for snowmobiles, sleds, and even snowblowers. 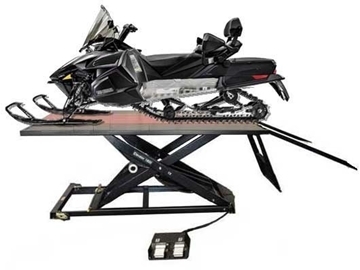 PRO 2500S 48" Heavy Duty High Rise Snowmobile Lift Table for many vehicles including snowmobiles, snowblowers and sleds. 10019 Upgrade Side Extension Kit from 56" to 69"